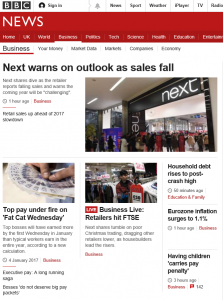 Will consumer sentiment lead to another recruitment rollercoaster? It’s my first day back in the office today and I’m feeling super positive about the year ahead. That’s pretty good considering that 2016 was one hell of a rollercoaster for us recruiters. Arguably, that’s a pretty odd statement as my business and (anecdotally!) my competitors, had a cracking year. So why was it a rollercoaster? Our clients, specifically in retail and hospitality, are hyper sensitive to consumer sentiment. I’m sure you have seen the surveys. Here is GfK’s survey - you’ll notice there are a few troughs! 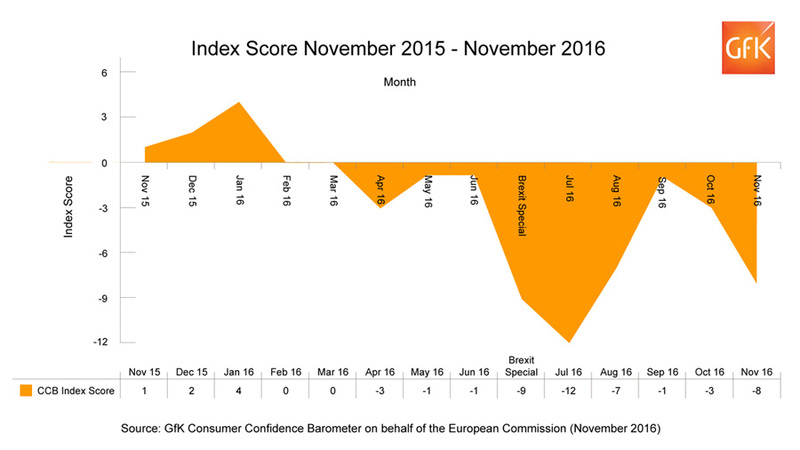 The graph above tells us that consumer confidence went from pretty positive at the back end of 2015 to Armageddon in July. There was a recovery before a further dip in November. Indeed, here’s a screen print from the BBC website today (Wednesday 04/01/17): It makes for pretty depressing reading. To top it off, footfall declined over the New Year period. 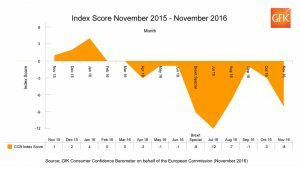 Given that we know that Article 50 will be invoked in March and that Trump will be inaugurated later this month we can be confident that another rollercoaster year is ahead of us. As you would expect, if our clients lose confidence they cut costs and, as we all know, the quickest cost to cut is people related i.e. less recruitment. Or at least, that was the traditional approach. Over the last two years we have seen a bit more resilience in the jobs market. Our client base is a little less sensitive to macro change, and while remaining cost conscious, less susceptible to knee jerk reactions. Additionally, not all sectors of retail or indeed other industries are impacted by poor consumer sentiment. Value retail is likely to see a resurgence in 2017 despite ever increasing competition. Arguably, Tesco & Morrisons will reap the benefits of the strategic changes they have instigated over the last two years. Here at AdMore we have invested in other sectors too, such as apprenticeships recruitment and that sector is forecasted to grow by up to 50% due to the impending levy. So you see, whilst I believe that 2017 is going to be another rollercoaster ride for consumer sentiment and that some areas of recruitment are likely to mirror that, there are plenty of reasons to be optimistic. That said, if you are a candidate, a hiring manager or a recruiter; we will all once again need to be very, very, very resilient! There is a thread on LinkedIn that is likely to run and run and run. It was posted with good intentions and borne out of frustration. The update reads as follows: “Definition of irony = Chasing a recruiter for several months and time and time again, them NEVER calling you back when they say they will, NEVER replying to your emails, having members of staff who answer the phone blatantly lie to you, then you getting a Head of HR job and said recruiter chases you to meet for a coffee and discuss my needs for recruitment within 5 days of your start date. Now that is ironic in my book! This is not a recruiter or recruitment industry bashing thread but my own personal observation.” Unsurprisingly it has turned in to exactly what you would expect, a recruitment bashing thread. Unfortunately the real irony has been missed altogether. The real irony is that recruitment has turned in to a circle of abuse that only the abused can break. You probably know this statistic already, but here goes. People who have been bullied are twice as likely to bully themselves. The candidate that experiences the worst that recruitment agencies have to offer is the only one that can break this circle. They can break this circle when they become the client. The client is THE customer. The stakeholder with the greatest power to define how recruitment agencies treat candidates. Indeed there are lots of things we agencies can do to improve the experience for candidates - all of which can be measured and reported. Unfortunately it’s an expensive model. Even more unfortunately, most clients don’t want to pay for it. The very people who often complain about the conduct of recruitment agencies are utterly unwilling to invest their own time and their (employer's) own money in improving the candidate experience. That’s the real irony. By Sophie Mackenzie We have worked on several high volume campaigns recently where there has been a requirement for candidates to sign an NDA (Non-disclosure Agreement) and this has prompted several queries from people who have been unfamiliar with the process. Here’s a brief guide! Why are they used? Otherwise known as a Confidentiality Agreement, an NDA is a legal contract used to prevent the sharing of sensitive information, normally for a specific period of time. Often used commercially to protect information regarding product patents etc. they can also be used in recruitment when it is important to control the sharing of information about certain vacancies. This could be for several reasons – the company may be undergoing a restructure or opening new stores and don’t want detailed information to be disseminated amongst the wider market and their competitors. They may need to hold back certain key pieces of information until other matters are resolved, for instance, contracts signed on property locations. Alternatively, the business could be acquiring a competitor or part of their supply chain. What does it mean? Simply, it is a contract in which you, the Candidate, agree not to share any information regarding the particular company, vacancy, location (the scope of which is outlined in the agreement). This is normally for a specified period of time. Once you have signed it, the company or the agency representing them, are then in a position to disclose the details of the company and/or vacancy. How does the process work? From an agency perspective, when briefing you on a confidential vacancy, we will explain that the role is highly confidential and before we can disclose any details, we require all candidates to sign an NDA. We are normally in a position to disclose some element of the opportunity so we know we are not wasting your time! The NDA will be emailed and you will then read and sign it before returning it to the consultant. Although it can be signed electronically, it will need to be sent as an email attachment so that there is an audit trail connecting it with you. Once it is received, you will then receive a call to go through the opportunity in full detail, as normal. Clearly, you need to respect the terms of the NDA and not disclose any details for the period specified. DO NOT be tempted to ignore it and openly discuss the role. Do Psychometrics make recruitment processes better? Are they currently reliable? Those tests have now been used for many years and in my opinion, they are not currently used at their best. Using numeracy and verbal testing as PART of a process can reinforce decision making. They should NOT be used as a filter in order to attract the best candidate. There is still no evidence that a candidate who scores well at these ability tests are better at their job than a candidate having a bad score. Similarly, Personality tests are reliable depending on their context. Using them as a first stage of a recruitment process could be risky and companies could miss out on some talent. The danger of using tests at the first stage of selection: One of my friends recently applied to a vacancy with a large corporate in the UK. What was the first stage of the process? A numerical and verbal assessment which she had to perform within 48 hours of applying. “Well that was fast!” she thought. “They are probably doing that in order to check the motivation of the candidate and to see how quickly I can react”. To be fair, for some companies this could be a reasonable way of thinking as thousands of applicants are hard to deal with. However, filtering candidates and applying tests as the first stage of any process is not about attracting the ‘best’ candidates, but about reducing the talent pool. There are plenty of fish in the sea. However, by doing this, are we not missing out on ‘good’ potential candidates? After all, some candidates struggle with these tests, for a variety of reasons (another blog for the future!). In my next blog, I will discuss the different approaches employed by companies when utilising personality tests to select candidates based on cultural fit. By Jez Styles You might have missed it but LinkedIn’s share price collapsed after their latest financial statement. LinkedIn has been under increasing pressure to increase its revenue streams and, with a slow down in growth to 20% in the fourth quarter from 56% in the equivalent period last year, many analysts are predicting this slowdown to continue with predictions of just 10% in 2018. At the heart of this slow down in growth has been LinkedIn’s over reliance on its ‘talent solutions’ which makes up 63% of net revenue. 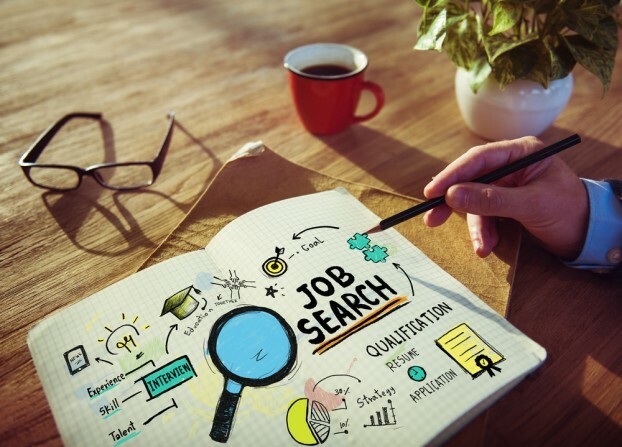 LinkedIn has attempted to differentiate its ‘adverts’ proposition from the standard job boards and through the acquisition of several firms including Fliptop. Late last year LinkedIn updated its job advert page for premium subscribers to provide further information for prospective candidates on employers. Read more here: http://techcrunch.com/2015/12/15/linkedin-revamps-its-jobs-listings-with-big-data-analytics/ Sounds great right? What happens when the analytics don’t look quite so rosy? And let’s face it, not every company on LinkedIn is in hyper growth. Indeed I happened upon the following advert recently. ***Looks like an interesting position doesn’t it? I might even apply myself… Hang on, let’s just look at those lovely graphs and charts before I do though… Oh! It seems that headcount has dropped by 18%, so 1 in 5 employees have left in the last 2 years. Hmmm that doesn’t look good for job security does it? Average tenure is 3 years? Well maybe the salary and package will assuage my concerns… Well, there are no details about salary and package and LinkedIn tells me that these roles typically pay anywhere from £30 to £59k…which is pretty broad by anyone’s standards. I might just pass on this occasion. And herein lies the rub. The more LinkedIn tries to differentiate and provide more information the more they will expose the ugly truth of recruitment. Not every company is Google or Facebook. Dry analytics will make some businesses look great, a lot very average and many quite unattractive. They don’t tell you about the culture, the people and what it’s like to work for the company. Which means that fewer, not more, companies will invest in LinkedIn’s talent solutions. Which means prices will go up and features will go down on our subscriptions. This means further disenchantment with LinkedIn. And if you want to see the numbers behind what I suspect is a growing trend in user disenchantment – click here! ***Apologies to the guys at Hotel Chocolat for flagging this, I really like their stores and I’m not entirely convinced these analytics are a fair reflection of their employer credentials. Hopefully this post might lead to a few more, not less, applications! I also dug out the numbers for Q1 2012… it was 31%. This got me thinking. I have had a lot of conversations with colleagues and peers in the industry and anecdotally, everyone is reporting a drop in responses from candidates. So I checked with a colleague in our research team and she looked at the stats for responses to Inmails she has sent. Between Jan 2015 and December 2015, Liz had an Inmail response rate of 53.6% - that’s a pretty good return on investment and indicative of the care Liz takes to personalise and engage through her messages. However, from Jan 2016 to today that response rate has dropped to 24.2%. When I worked for a ‘large international recruitment firm’ I was fortunate to have access to an enormous database. I would go as far as to say it was better than LinkedIn is today. Top line numbers always look good. The devil is in the detail. Databases go out of date…and need a LOT of maintenance. …and people lose interest in being on said database and stop responding. so you end up with an ever increasing haystack And that is what has been happening (increasingly so) to LinkedIn. But, LinkedIn has one more very big problem. Its entire validity is dependent on its users updating their database. the needles in said haystack don’t look like needles anymore That’s a bit of a problem when a declining proportion of users are returning to the site and as a consequence updating their profiles. So when an agency says that they have a ‘pool of talent’ that other agencies or recruiters can’t access I wouldn’t necessarily guffaw too quickly. Because this is exactly when niche specialist knowledge comes to the fore once again. Of course, this flags up one more question. Why is engagement in decline? By Jez Styles It is 2020 and all the wild predictions about changes to the world of recruitment are being realised. Here are 5 news stories from across the UK. February 15th, 2020. London. The Government’s flagship Social Media platform ‘LuckedOut’ signed up its one millionth user last month. A spokesman for the Department of Work & Pensions announced that the site had been an “incredible success story and had helped over 100’000 people return to work.” Critics of the platform believe the mandatory sign ups for those seeking benefits ran contrary to their human rights. Pressure group ‘Right to unemployment’ released a statement condemning the government for forcing the unemployed to sign up to the site to earn benefits. “As part of the conditions to earn benefits individuals have to post a minimum of 5 motivational quotes, 10 pictures of cats and ‘like’ at least 25 articles every day, we fail to see how this could be a good use of time.” March 14th2020, Manchester. A man failed in his bid to overturn a dismissal from his ‘future’ employer yesterday. An employment tribunal heard that, Peter Parrot, was dismissed for Gross Misconduct before he had completed his interview process. As part of the selection process Peter was asked to complete a range of tests and gave consent for the company to analyse web based material, social media and test results. A Predictive analytics program found that Peter was 99.6% likely to breach the company’s code of conduct. ABC Enterprises, released the following statement: “This is a victory for employers everywhere who risk hiring unpredictable employees. We used the predictive analytics software to give us insight in to the likely success of candidates; the programme found that the candidate in question was certain to be dismissed in the future. Our legal advisors believed that we might open ourselves up to claims from other employers in the future if we failed to follow the normal disciplinary process and as such Peter Parrott was found guilty of gross misconduct.” Peter parrot has since been dismissed by his then employer and has been unable to secure further employment. Peter responded to the statement on LuckedOut: April 10th 2020, Birmingham Following the banning of zero hours contracts in 2018, food Retailer ‘Fork to Mouth’ has sought to get around the legislation with the introduction of ‘minus hours contracts.’ All employees have been asked to sign up to the new term which requires employees to pay their employer should they not work a minimum of 47.5 hours. For every hour missed they repay the equivalent back. Employees have complained that some managers have created a rota system where employees work every other week which in essence means they are receiving no salary. Fork to Mouth’s HR director defended their approach and has refused to withdraw the minus hours contract. Former employees have taken to LuckedOut to voice their disgust: May 1st 2020, London Recruiting App Kinder (pronounced kin der) has announced record profits for the 3rd quarter in a row today. Kinder attributed their growth to the rapid collapse of the Agency recruitment market and their unique analytics software. Users upload every interaction they have with another person via social media sites or physically via their Mandatory Google Glass implants. Further data capture allows the app to map how the user responds to the individual via facial recognition and communications which creates a ‘kin’ score, the theory being that the more positively you interact with someone the more they are like a member of your family. Every user has a profile that is used to match hiring managers with employees via their kin score. Kinder currently has a 96% market share of the recruitment market in the UK. Kinder’s CEO recently dismissed claims of privacy infringements and suggested that if people didn’t want to find a job [through their app] they could always sign up to LuckedOut. In response LuckedOut users shared a picture of a cat 276’000 times in one day: Sep 10th 2020, London The last recruitment agency to operate in the UK closed its doors today. Following Kinder's recent announcement of reaching 99.4% market share employers no longer need to use recruitment firms to fill vacancies. The news has been met with a mixed reaction across Social Media. On twitter the hashtag #whodoweblamenow trended for much of the day. A number of Teachers have noted a spike in former Students attacking the profession and blaming them for ruining their future careers. In response to the news users on LuckedOut liked a picture of a cat 1.2m times. Determine what the ratio is between own brand and branded products. Are the products mainly own brand or branded? Where do the own brand products lie on the shelves in comparison to the branded options? How are the ranges put together? Are they design led or trend led? What are the prices of the products? How competitive are these prices? How broad are the product ranges? How many SKUs are on display? What is the availability? Which options are the slow sellers and are they being promoted accordingly? How is labelling and packaging used to support the promotional activity of heavily promoted products? Does the retailer offer a good/better/best product option (depending on size of the store) to ensure the customer is offered a variety of choices? How are the goods displayed? Are they going to maximise sales? The image of the store and its footfall. This fundamentally depends on the socio-economic factors of the town/city the store is located in, as different products will be promoted and different price points will be set in accordance to the location of the store. What methods are in place that encourage repeat purchases and the return of consumers to the store? For example, Tesco club card points and the Sainsbury’s Nectar card. If the company you are visiting has a loyalty scheme, try and figure out how this can directly influence consumer behaviour. Are there in-store concessions that could affect sales/ranges? If so, where are these concessions situated within the store? What are the tactics behind this? Choose the venue for your interview carefully – ideally at home, in a quiet room with a door. Get the lighting right and do a test Skype call in advance to check this. Think about what your interviewer will see behind you – a neutral background is ideal with minimal personal belongings in view. Ensure that pets/children/flatmates are being taken care of and know not to interrupt you! Turn any phones to silent. Position your laptop so that the camera is at eye level – a much more flattering angle. Test your equipment in advance (a good opportunity to Skype your Mum). Ensure you have a strong Broadband connection. Practice looking at the lens rather than looking at yourself in the corner of the screen! Practice active listening (nod, “hmm” etc.) so that your interviewer knows that you are listening and that there is no delay. If there are any technical problems, address it with the interviewer and if necessary call them back – don’t try to persevere if you can’t hear them properly. After the interview, you should email your thanks – just as you would for any other interview. Investing in a career mentor may be an obvious thing to do if you are driven and ambitious and want to rapidly develop your career, but sadly, not enough people take the step of finding someone who can really help them develop professionally. This could be because they don’t know where to find a mentor or feel they do not have the time, however I genuinely feel people are missing out. The reality is that it does take both time and effort to develop a fulfilling and successful relationship with a mentor, however, as I have outlined below, the benefits of this are considerable and can make a real difference in helping you further your career. 1. Focus: One major benefit of having a career mentor is that it can help you stay focused on your objectives and keep on track. We all suffer from distractions, but by expressing and sharing your goals with a mentor you are allowing yourself to be held accountable for achieving those objectives. This added motivation and pressure should therefore enable you to deliver quicker results. 2. Personal Development: Not only can a good mentor share with you their own personal experience, but they are often able to identify your talents and help you to develop them further. Your mentor should help you grow an extended network, which will also benefit you from a development perspective. Talking through things with people more experienced than yourself can only help you to learn and grow quicker, increasing your knowledge and understanding of the field in which you operate. 3. Career opportunities and progression: Having a mentor from within your industry is also another great way to find out about new career opportunities. It is highly likely that they will know what is happening within key organisations and this information can help guide you. Not only could this allow you to be aware of a role before it reaches the open market, but they may also be able to provide you with an introduction or recommendation. In addition to accessing more opportunities, your mentor is likely to be able to give you guidance and advice about moving your broader career forward. 4. Networking: A good mentor is likely, over time, to introduce you to more like-minded individuals from their own professional network. This extended network, if managed correctly, should provide valuable connections throughout your career. A good mentor can open doors for you in a number of different ways and in other areas of life as well. 5. Impartial Advice. The fact that a mentor is independent and not involved directly in any particular situation allows them to provide you with an impartial viewpoint. Whilst you shouldn’t expect your mentor to provide all the answers they should be able to provide you with some “counsel” which will hopefully avoid you making costly mistakes. 6. Developing relevant skills Having a career mentor, particularly one with skills and experience in your sector, can greatly assist you in developing new skills and experiences quicker. This can only be of benefit in accelerating your development and progression. 7. Real life experience A very obvious benefit of having a career mentor is learning from their real-life experiences in the field in which you operate. Due to a mentor’s knowledge of you and your sector, their advice and guidance will be very tailored and specific and therefore much more useful than generalist advice available online. 8. Shared success A mentor is not only someone to provide you with support and advice, but it is also someone to share your successes with. This makes the whole experience rewarding for them as well as for you. This can add further motivation to you and drive you on to even greater success. MAKING IT WORK WITH YOUR MENTOR The theory and indeed benefit of having a mentor is obvious, so why don’t more of us have them? One of the main reasons is that making the relationship work is not that easy, especially amongst the other demands on our time. So what do we need to think about to try and make sure it works, not just for us, but of equal importance, for the mentor. Make the effort Like any relationship, it takes time and effort to get things going and to foster a strong relationship. In this relationship, although it is two-way, you are likely to be the main benefactor and therefore it is only right that you are seen to be making the appropriate level of effort. Establish goals In order for both you and your mentor to gauge and measure the success of the relationship, it is important that you establish goals and objectives and share this with your mentor. Listen and act The acting element is a critical factor because any mentor is going to want to see that you are taking on board their advice and doing something with it. If you do this and it works, it is important to give that feedback to your mentor displaying the gratitude they deserve. Make it formal It is important for both parties to be very clear about what the expectations are. Although a lot of relationships may start informally as they grow and develop, it is important for both parties to understand the parameters around areas such as frequency of contact and subjects to be covered. Mutual benefit A mentor may have a range of motivations for giving up their time, but it is also worth thinking about what you can give them in return. You might perceive, with significantly less experience, that you have a limited amount to offer, but there will always be certain areas such as Social media etc. where you can share your knowledge and experience.